Some weddings take longer to plan than others. The union of The Daily Beast and Newsweek magazine finally took place with a coffee-mug toast between all parties Tuesday evening, in a conference room atop Beast headquarters, the IAC building on Manhattan’s West 18th Street. The final details were only hammered out last night. What does this exciting new media marriage mean? It means that The Daily Beast’s animal high spirits will now be teamed with a legendary, weekly print magazine in a joint venture, named The Newsweek Daily Beast Company, owned equally by Barry Diller’s IAC and Sidney Harman, owner (and savior) of Newsweek. As for me, I shall now be in the editor-in-chief’s chair at both The Daily Beast and Newsweek, bringing with us as CEO my Daily Beast business partner Stephen Colvin, who launched The Week Magazine in the U.S., as well as Maxim, as president of Dennis Publishing. His dynamism has created 66 new ad campaigns for us since I persuaded him to join The Daily Beast a year ago. It’s a wonderful new opportunity for all the brilliant editors and writers at The Daily Beast who have worked so hard to create the site’s success. Working at the warp-speed of a 24/7 news operation, we now add the versatility of being able to develop ideas and investigations that require a different narrative pace suited to the medium of print. And for Newsweek, The Daily Beast is a thriving frontline of breaking news and commentary that will raise the profile of the magazine’s bylines and quicken the pace of a great magazine’s revival. I'm impressed with how Newsweek's outstanding staff has continued to put out a lively, well-informed magazine after the departure of their tireless editor, Jon Meacham. The Daily Beast houses many top talents from the print journalism world: Our executive editor, Edward Felsenthal, and managing editor, Jane Spencer, are formerly of The Wall Street Journal. We’re also home to columnists like Howard Kurtz, who only recently arrived from The Washington Post, and Peter Beinart, formerly of The New Republic. They and many of our other contributors from newspaper and magazine journalism joined forces here with the young digital natives of our newsroom to make something new at The Daily Beast. Today, we look at print from the refreshed point of view of an expatriate who sees the old country with new eyes. That will create a great new creative energy—just as on the business side, it offers a superb dual marketing platform. It takes two inspired entrepreneurs like Barry Diller and Sidney Harman to undertake such a challenging media experiment. Barry Diller brought me to IAC to partner with him in his vision of a new website that would curate the news for smart readers, with a distinctly independent point of view. With nearly 5 million unique visitors a month after just two years, The Daily Beast has evolved into a site that also, and now predominantly, offers original journalism. Barry’s support, insights, and intellectual daring have been a joy to work with every step of the way. Both of us look forward to joining with Sidney Harman, who made his fortune and reputation as founder of Harman International, the worldwide audio manufacturer, and has a mind that’s alive with a cultural curiosity that’s exactly what you need to succeed in the publishing world. I very much admire his passion to restore Newsweek to its glory days, and with a bit of luck and a lot of hard work, we will. Join us for the journey! 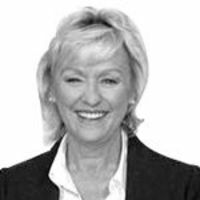 Tina Brown is the founder and editor-in-chief of The Daily Beast. She is the author of the 2007 New York Times best seller The Diana Chronicles. Brown is the former editor of Tatler, Vanity Fair, The New Yorker, and Talk magazines and host of CNBC's Topic A with Tina Brown.